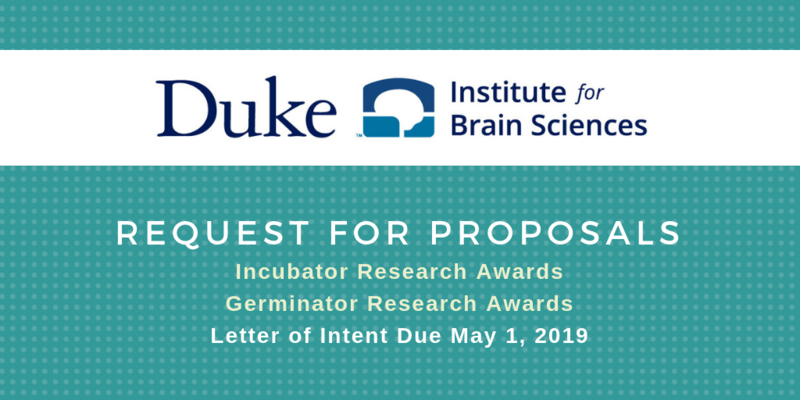 The Duke Institute for Brain Sciences (DIBS) is pleased to announce the call for proposals for the 2019-2020 Research Incubator and Research Germinator Awards. These awards provide seed funding to support interdisciplinary, innovative brain science research within Duke. By supporting such research, DIBS hopes to encourage innovative approaches to problems that transcend the boundaries of traditional disciplines, integrating the brain sciences with the social sciences, physical sciences, gene sciences, humanities, law, business, public policy, mathematics, computer science, and engineering. We aim to support the exploratory phase of research that is likely to lead to external funding if successful. See more information about the Research Awards program, including the 2019-2020 schedule and full application forms. Novel collaborations among at least two faculty from different departments at Duke, for one year, up to $100,000. See 2018-2019 Incubator Award recipients and projects. Interdisciplinary projects or training experiences relevant to the brain sciences. Open to faculty, graduate students, postdoctoral fellows, and residents, for one year, up to $25,000. See the inaugural Germinator Award recipients and projects. For Incubator Letters of Intent only: Brief description of the novelty of the collaboration. If any subsets of the group have worked together before, describe how this is truly a novel collaboration. See more information on the DIBS website.